Beautiful watches! I bought three for family and friends. They loved their new watches. The price is unbeatable and quality is perfect for such a classy watch. You won't be disappointed. The complimentary colors of blue dial with brown leather and rose gold is perfect color combination for a nice watch for the office or outside the office. I am happy with my purchases. Great price for a high quality watch that will shock your eyes when you take it out of the box. It is water proof up to 3 atm. I personally bought the black strap and brown dial and am in love with it. Great price, shipped and came on time! Love this watch!!! I buy a new watch every other week and now have 15. This is by far my favorite. 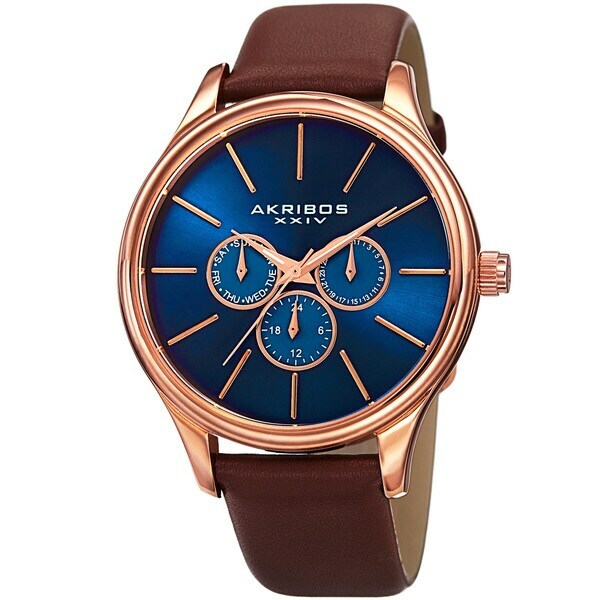 Akribos makes very high quality watches and they look great. I get so many compliments on this watch. The style, quality and color clarity of this watch is so beautiful! Was very pleased to offer it as a gift. The watch looked nice but I had to return because the "day of week" couldn't be set separately from the "date". I talked to Akribos and they said to pull the crown out just a little to change the "day of week" but that didn't work, so I sent it back to Overstock. I liked the watch but not being able to change the chronos dials easily was a deal breaker. the colors shown represent very well on the real thing. classy watch with a thicker leather band. recommend. Ohh what a time piece. This watch is very stylish with its dials and the blue face makes one looks like a million bucks. I bought it for my boyfriend who loves everything about it. He's generally very conservative also considering his position at work and this makes him stylish without being flamboyant. I reccomend this piece to anyone. I'll be back for more. When I first saw it I didn't like think it'll look nice on my husband I thought it'll be a bit small. But when he wore it, it looked perfect! I love the color combination of the rose gold and the leather band. This watch was bought as a gift a year ago and the recipient continues to wear it each day without any troubles. It is a handsome watch for any young man. This watch is not as good looking in person. Overall the watch looks really nice. It is packaged really well. It was well worth the sale price. My husband liked it! It was good quality and looked really nice! Purchased several of these as gifts. They were well received! They appear to be much more expensive than they actually were and reports are that they have held up well. "Is this a heavy leather band or thin? Strap is 9 inches long, is this long enough for a big man?" This watch strap is 4 mm thick. "Which option is the blue dial with rose gold tone and brown leather band"
We have updated the drop down menu. We hope this helps. "The color options descriptions are very unclear. What color is the brown strap, rose gold rim around black face? Picture 5." Hi, We apologize if this was unclear. The watch with the brown strap, rose-tone case and black dial is the Rose-tone color option. Hope this helps! "I want to buy one of these, but the descriptions in options aren't very clear. I want the blue face watch with the brown strap. There's one described in the dropdown as Rose-tone/Blue. Is this the watch with the blue face and brown strap, or the watch with the blue strap? Both seem to have blue faces and rose tone casings." It would be just the rose-tone option for the color that you want it in. Large face, most men's watches have a small face, and when you wear one it looks like a bracelet.